Here are the official results! The Creative Container Contest has officially come to a close! Its amazing how quickly 6 months flew by! After 6 months of steep competition, we've got 20 amazing container reefs that have made it to the end to compete for the three prize categories! Voting will open in a few days, and we need the participation of the Nano-Reef community to choose the winners! The contestants have each put together a write-up of 250 words or less and selected three photos to summarize their container reefs. Please peruse the below post to see all of the contestants' final summaries and decide how to cast your vote in each of the below categories. Click on any contestant's photo to be taken to their build thread to read more detail about their journey during the contest. Also, head over to the monthly FTS thread to see each of the contestants' monthly photo updates throughout the 6 months of the contest. Voting will open tomorrow, Monday April 2nd at noon (PST) and will remain open until noon (PST) on Monday April 9th. Make sure to get your vote in so that you can help in selecting your favorite builds to win these amazing prizes! In the event of a tie in any of the categories, @Christopher Marks will cast the deciding vote! Thank you to @Christopher Marks and @pj86 for all their help hosting the contest! Thank you to all the contestants for participating and putting together such creative and inspiring builds! We've all learned a lot following along with the contest, and its been wonderful to prove that such tiny, simple reef set-ups can be successful! Thank you again to our wonderful sponsors for their generous support of the contest! The pico jar was established October 5, 2017. I used an Anchor Hocking glass cookie jar that holds about 2 gallons of liquid. Equipment includes an air pump, air stone, mini heater, and Reef Radiance Led bulb. I used dry rock and cycled it using bacteria in a bottle. My jar only has coral, rock, and “live” sand. I never added any creatures to the jar besides coral. Today I have 1 snail that magically appeared. He hitchhiked in on coral. This jar has been a breeze to maintain. It had the typical early ugly phase and I would have to do 2 water changes a week to keep it looking nice. But after about 2 months that went away. I’ve been doing a water change once every two weeks and things are going strong. LPS LOVE the pico jar! Growth is phenomenal. I didn’t experience any catastrophes or near catastrophes with this jar. I sometimes expected to check in on it in the morning and see a disaster but that never happened. I just thought with such a low water volume things could go wrong so easily. But this experience proved me wrong. I would highly recommend a pico jar to someone that is looking for something very small with not a lot of work. Don’t add a fish though…I think that would totally change the experience from laid back to biting your nails. That’s my biggest takeaway. I’ve learned I can really enjoy a reef tank without fish. My initial idea was to create an attractive but simple feeder shrimp jar. I chose the 3 gallon cookie jar for its wide mouth and interior space enough for 150 shrimp. I wanted a lid to control evaporation and prevent jail breaks! Painting the outside glass gave a clean look inside and out. I learned the hard way to epoxy the rock work into 1 structure to make it stable and removable for easy cleaning. Epoxying a coco worm tube hid the airline tubing used for flow. A rio 90 also added flow and heat. Most of the coral and macro algaes were added right after the cycle. The growing coral took up real estate and the macros took up nutrients and seeded the jar with pods, micro stars and worms. There are 25 different coral, 3 different macros as well as 15+ feeder shrimp and a pom pom crab named Cheerleader that call the chalet home. Nuisance algae was never a problem. The jar is fed 9 drops of microvert, a frozen cube of rotifer and bbs 3Xs a week, plus mysis juice. 100% WCs 2Xs a week keep nutrients in check. The par 38 bulb is on 6 hours and is 20 and a half inches above the lip. I accomplished my initial goal but its the insight, practical experience, not to mention the comraderie that was the true value. Thank you and the sponsers very much for hosting this contest! I was so excited to join this contest! I’ve wanted to do a Nano-Reef contest for years but this was the first time I’d been able to join. My goal was to create a little garden in a jar that I could enjoy and which would be easy maintenance. I also wanted to continue a previous idea of a GSP garden featuring a variety of GSP (and PSP), as well as interesting invertebrates. 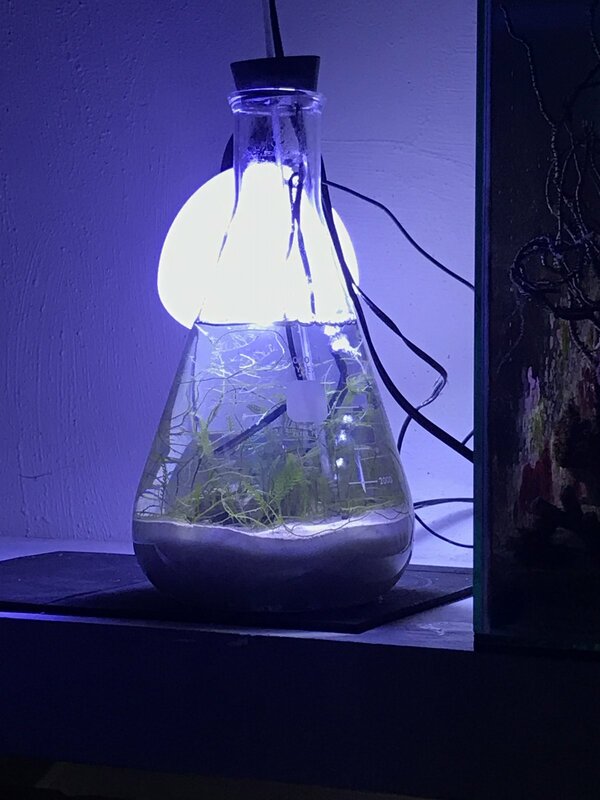 The beginning was bumpy with many issues, from algae problems, replacing the sandbed, losing several squat lobsters in a row, figuring out flow and lighting, dying gorgs nuking the jar, and more. Once it began maturing, things smoothed out a lot and I was able to enjoy the jar, especially after establishing a zoa garden (after years of failing to grow them). A reef jar is a wonderful choice for anyone wanting an inexpensive, easy-care reef, especially with space limitations (mine is on the corner of my desk). I added an adorable bimaculatus blenny who was a joy to watch! Seeing the interactions between the residents of my tank was a lot of fun. The best part of the contest, though, was seeing the ingenuity of other Nano-Reefers have a chance to shine, and I loved following the other builds and discussing ideal equipment. It is really amazing what can be done in such a small space! It’s been an honor to be part of something highlighting how wonderful pico reefs can be. This was an amazingly fun contest! I was able to keep a wide range of corals in this pico keeping good color and continued growth. The shocking part is how well you can keep such a great small reef with only the simplest equipment. 12wt ABI bulb $25, Hydor Pico powerhead $25 and a 25wt Neo-Therm heater $60. My biggest mistake was not using a better heater early on. I had very wild swings before switching to the more expensive Neo-Therm. I really feel like the success of this tank highlights the importance of three key points to having a great reef, regardless of size. 1st Strong enough lighting. This light was all the power I needed for a small tank. Rather than complicated options on most modern LED lights like controlling intensity and color I just placed my corals at different levels of the tank to provide the correct about of light and used a cheap timer for on and off. 3rd Nutrient control. This tank has no crazy algae and is growing corals at a good rate. Overstocking and overfeeding is every tank’s biggest mistake on a larger scale. I completed about 8 100% water changes in 6 months and the only consistent feeding was a drop of AF Energy once every 10-12 days. I really enjoyed this challenge. I learned from the experience, had fun, and enjoyed seeing everyone else's journey too. I had fails and gains with my jar. Maintenance was easy and relaxing. I did a thorough cleaning a few times which led to re-aquascaping a couple of times. It helped maintain the tank well. During an algae outbreak with gha, I did a complete full cleaning of the jar, sand, & peroxide treatment. It was fast & worked. Napoleon & Deb (pom poms), shared their pom's when one lost theirs. I knew this was possible but it was cool seeing this in person. Pedro (hermit) surprisingly in a small tank, hasn't murdered my snail...yet. Coral warefare and loss of 3 frags was a new experience. I had to remove my acan enchinata and chalice, they were too aggressive in such a small container. Overall coral growth in a simple system in 6 mnths was good. Sad to see the contest come to an end, it was great. This contest was appealing to me due to the low cost of entry, as well as the freedom to choose livestock and equipment. In addition, for me, it was a good introduction into pico tanks. Although I tried to limit costs, I still wanted to purchase new coral frags specifically selected for this tank. I chose three cultured coral frags from Diver's Den. I also added a few macroalgae frags and snails from my other tanks. I fragged the LPS with a coral saw and split the GSP into several separate mats. The Duncans almost tripled in size, and the Blastos have recovered nicely from being fragged. I had originally hoped the Green Star Polyps would become ground cover. But unfortunately, I lost all but one small GSP frag (which is just barely holding on). For DIY projects, I drilled the jar to fit the heater, airline tubing, and temperature probe. I also used a Dremel to bore out a couple of rocks for coated magnets (which I secured with some J-B Weld to make mag-rocks). I used new dry rock that was cured in another tank. In addition, most of the water changes were done with water from my other tanks. I believe my results would have been better had I used fresh saltwater instead, as many of the other contestants had done. Thanks to all the great sponsors, and for the contributions made by @Felicia, @Christopher Marks, the contestants, and other observers. It was both educational and fun. This bowl has quickly become a family favorite and will remain in our kitchen indefinitely. I'm going to throw a canister filter on this thing and make the water cleaner than a LFS's RODI. Lighting will also be upgraded to an AI Prime as the 12" gooseneck should place the light pretty well over the tank and look way cleaner and offer much better spectral options. Essentially I'm throwing most of the contests husbandry requirements out the door but trying to incorporate its finer points like 100% WC's. I may end up attempting to drill in some overflows with an underwater dremel and some 1/2" bulkheads I already bought, just unclear if I would try to run it to a sump or just the canister filter. Check back in April in the bowls aquarium journal as I will have much more visually appealing actinic shots of the corals too. Thanks for reading and keep in mind how badly this pico would love a prize nanobox light or a mini seahorse tank right beside it! Plus and I must be honest here, I love pico reefing, it is so choice. If you have the means I highly recommend picking one up. This simple yet elegant half gallon container is certainly my “pièce de réef-sistance” and is a perfect demonstration of exploiting the so-called boundaries of pico reefing. While still in its relative infancy stage, I believe my experience with this pico has shown that water volume is certainly not a constraint, as this reef is in a humble half gallon container and with displacement holds merely 0.37 gallons. My pico has proven that size is actually the opposite of a limit; that due to their ease of care, low cost and maintenance they actually open the doors to wider audiences. I have also demonstrated tremendous frugality and resourcefulness from my make-shift heater to the light fixture, and by doing so exemplified the beauty in the simplicity of picos. I feel this modern globe pico embodies the true goal of the CCC by expressing creativity through the contrast of the minute against the magnificent; the irony of the seemingly insignificant coral and the vastness of the globe. To me, the globe is a reminder of the truly unfathomable amount of life we pack into all our reef tanks; from the unseen micro-life to fish and inverts. Piecing the LR base together and molding the continents from dyed concrete was no simple task either; it required a good amount of perseverance which I believe in the end paid off. Overall, I’ve thoroughly enjoyed the journey with my pico thus far and hope that it continues to thrive for a long time to come. This Pico Contest has been an amazing challenge. There were a lot of firsts with this adventure. This was my first attempt at using a non-aquarium container to raise coral and I'm extremely pleased with the results. It was also my first contest as well as my first attempt at a 100% waterchange. I've learned that growing large colonies is much easier to witness in a small container, my zoas have spread the most since the beginning. I also discovered the need to feed small inverts much more frequently in a tiny space. My peppermint began picking on a few of the corals and ended up killing an acan before I realized what had happened, the solution was to give him and the hermit a pellet every day and religiously do my weekly waterchanges. Another lesson was in the proximity of coral. When I first put the hammer into my tank, I was afraid that it would sting the heck out of everything in the jar, as the months went on I never saw a single stinger tentacle and felt comfortable to place coral closer to the aggressive hammer. Aiptasia was a hurdle that I needed to overcome and used both chemical and invertebrate help to manage them. One thing I would have changed would be to add more soft coral into the jar and add them sooner. The best growth was the zoanthids and mushrooms. I would also add in amino acids sooner after the start of the jar. Building the Florida shallow reef pico bowl was rewarding. I added several Florida-area surface-dwelling zoanthids to populate the shallowest rock. Lower in the reef is a ricordea garden, very hardy mushrooms common on the Florida reef. The reef floor contained rock flower anemones. 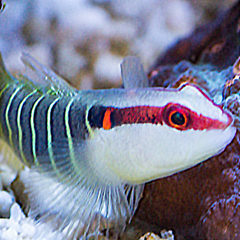 For fish, I added four green banded gobies, which occur in the Florida keys. I was not able to find Pederson shrimp during the winter. Dragon’s tongue and mangroves contributed plants to the scene. The tank did surprisingly well. The smaller species of Cerith snail kept the rock crevices clean and Astrea did more strenuous cleaning. Initially, a weekly “100%” water change kept things clean. After four rock anemones and the gobies were added, I changed the water twice per week due to a film that otherwise formed on the surface after a few days. Clearly, the biomass was too high for a two gallon volume with four anemones and feeding four fish daily In spite of this very little hair or encrusting green algae formed. The round walls of the tank made it cumbersome to scrape all the purple coralline algae that formed. I wish my larger tanks were as easy to care for as this tiny biotope, which has remained nearly pristine. This tank has made me realize how hardy some reef creatures are, and having a tank that is best viewed from the top down was quite nice. I now have a desire for a larger shallow lagoon tank – with planar walls! This jar was put together with a shoestring budget, and I wanted it to be as simple as possible. So far it consists entirely of soft corals, oh and 1 torch. I run an older Innovative Marine pump and an airstone for water circulation. For light I run an ABI Tuna Blue bulb hanging off a BRS gooseneck. I have managed to change the water in the jar twice since starting it, and I don't plan on changing that routine anytime soon. I'd say the biggest strength of this tank is the elegance of the build itself. No wires out the top of the tank and the purpose built stand looks really clean. My Mother-in-law even commented how nice it is, that is saying something! Lessons learned. Things happen quick! I had a significant tank crash this week that wiped out all the sps and lps in the tank and led to the first major algae outbreak. Birdsnest, monti and hammer all gone. Best guess is that a snail died and the tank just couldn't neutralize that nitrogen. Reccomendation: be happy with softies in a tiny tank. I never fed the tank and consequently only had to do a WC once a month or so. But the tank crash happened less than a week from a WC. Snails are going to die in any tank. Also think clearly about how you are going to clean a tank. Honestly it would work best to have something you can completely empty (rock, coral, everything) to clean with each water change. This has been a fun experiment and I'll keep it going. Here's the final FTS. Zoas aren't cooperating. Here's the whole setup today. Here are my final 3 pics for the Creative Container Contest. I have taken the liberty of editing to compliment my Halloween skull drink container theme. All coral in this tank was chosen based on theme as well, e.g. red people eaters, toxic green nepthea, etc. Photos were taken on an iPhone X with an orange gel filter and then basic Instagram editing. I have had an absolute blast with my first ever coral contest! This is my first pico and I have enjoyed learning the totally different husbandry methods unique to picos. I have been fascinated with the stability of the little tank with no filtration other than macroalgae. This was also my first foray into PAR bulbs. As you may have read in my build thread, the bulb I selected was burning the ever loving snot out of my corals ultimately requiring tape over 1/3 of the LEDs and removal of my leptoseris to my main tank so it did not die. Once par was dialed in, everything was noticeably happier and even more stable. As someone who loves her gadgets, I thank you all for helping me appreciate what we can do with only simple, stable maintenance. I look forward to more fun with all of you in our nano reefing adventures! When we started this pico, we had a very specific idea in mind, highlight two of our favorite corals; RFAs and Zoas. We succeeded in this venture. I had seen someone doing a single specimen reef jar when I first got into the Hobby and I told myself I wanted to do that. When this contest came around it was my chance to do just that. I was really hoping I would get some baby RFAs and hopefully learn how to take care of them, sadly that did not happen. The biggest struggle encountered with the Jar chosen was the opening being pretty small, it made it really hard when adding corals throughout the contest, as i was limited to only putting them where I could easily reach or I risked water everywhere. This made maintenance tougher too as I could not reach everywhere. The next biggest struggle was temperature fluctuations, we live in a very old house and our house heater couldn’t keep up when it got really cold. Lesson that was learned here, buy a really good timer, ours was on a smart timer, connected to the internet. I was out of town so this piece of equipment proved invaluable to being able to quickly make changes even while I was away and keep everything alive. All in all as a relative newb to reefing, this contest and community has made me more comfortable with reefing and opened my eyes to the beauty of simplicity in reefing. And final Shot is the one I think encompasses the whole "Midwest Industrial" theme of my build, yes that is a late 19th Century Sewing Machine we used as a "stand:"
My goal with this jar was to keep a cheap, simple coral reef that beginning reefers could easily copy to learn how to reef without spending a lot of money. To keep things simple, I only kept corals, no fish or inverts. In keeping with the “cheap” theme, I tried to use “free” corals from my other tanks…although I did give in to temptation once at the lfs and bought three corals just for the jar. Smaller rocks outside the tank become huge rocks inside the jar, and once corals start growing, they are hard to remove to clean the jar. The curved glass, small opening, and blue light make photography very difficult. Unreliable wifi power strip – the light stayed on overnight once, bleaching corals. We need six more months grow-out time! This project builds on two of my passions: coral aquaculture and sculpture. I view the system as a tiny underwater sculpture garden and have tried to make it visually pleasing and interesting. But I was also thinking about how people interact with coral reefs and with nature generally. For example, some figures seem to enjoy their interaction with the coral, and for others, that relationship seems more complicated or dysfunctional. Some of the figures are human, one is a dinosaur/bird (I think a lot about extinction), and one is a human-animal hybrid. I could talk more about my intentions, but I like to leave enough unsaid to let people see it in their own way. Like my other reefbowl, this is a simple system with only bare airline, Betta Stik heater, temperature controller, and a cheap par38 lamp in a conventional fixture. I feed every Friday and change all the water on Sundays. I tried to place corals and sculptures with attention to composition, color, competition, and lighting needs. I made the sculptures from paper clay, which is porcelain mixed with paper pulp. The paper burns away in the kiln, leaving a porous, lightweight ceramic. The process has gone well overall, although I lost an acanthastrea early on. The only real problem I’ve had is a persistent film algae that the snails can’t quite keep up with. I scrape it and treat it with peroxide every week so it doesn’t take over. The mad science experiment started out, as so many of them do, as an exercise to see if it could be done, not necessarily considering whether it should be done. This tiny little tank had had its ups and downs, mostly due to my own lack of diligence, but I think that overall the experiment has been a success. Going forward, I will probably move some or all of the corals out to a larger tank for grow-out for a period of time, but the flask will continue to live on! I have enjoyed the process, but do feel that my pico got put on the back burner due to several factors (a few jobs and a grad class). Despite that, it was a great learning process and in the future (when I have more time to dedicate to it), I would love to get another pico going. · Had I had a bit larger of a container, it would have been a bit easier. I love the way my container looks, but it made it very difficult to move anything around/aquascape at all. · I lost a few zoas due to all the hair algae that accumulated. · We got some REALLY neat baby blue tuxedo urchins who I’m sure have been very happy with a plentiful food supply. · Figuring out how to heat the tank was a challenge, but I had a small pump laying around that got the job done, as well as circulated the water. · The combination of baby urchins and flame algae have done a fantastic job of reducing the unwanted hair algae. · The salinity actually stayed very stable for as small of a container as I had. 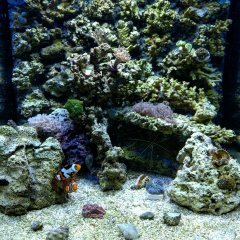 · The duncan, blastos, and acan turned out to be very hardy additions. All in all, I am thankful to have been able to participate in this contest and even though I didn’t have as much time to devote to it as I would have liked, it was still neat to participate and see how things changed over the course of the last few months. Thank you to everyone who made this possible! The “Cephalopico” is a 6qt. food storage container that was originally going to have an octopus theme (decals on the outside) but instead decided to make a DIY overflow (because I can’t have a tank without DIY). I used a piece of PVC pipe flattened out a bit in the oven, with some holes drilled in it. It hides a small pump (45gph) and a 10w heater. Due to equipment shipping time it got wet in December and added the inhabitants in early March. During this time though I observed the fauna, including pods, worms, and a bunch of digitate hydroids which are interesting! For final stocking, I used this CCPico as an opportunity to house a decorator crab. An opportunistic feeder I likely would not consider for my main tank. The crab isn’t always out and about but it’s also not typically hard to spot (due to size). I can coax it out with a pellet or two pretty much anytime – the thing is like a bloodhound! During this multi-month competition I’ll admit that I wasn’t really putting my all into this tank. My total cost for this build was about $40 (Heater-10, light-8, pump-5, container-$7,pipe-free,rock/sand/chaeto-stolen from DT, Decorator $7, Hermit-3). What I did do though – was enhance my enjoyment of the hobby by experimenting and finding a way to keep a very low maintenance pico tank that will be suitable for having on my desk at work now that the contest is over! Thanks for organizing the contest! Wow, it's going to be seriously difficult figuring who to vote for Great job everybody! I know right?! There’s so many strong contenders! Good luck everyone, and great write ups! Some pretty interesting things going on. my I direct a question to natalia_la_loca: Where did you get those little statues? I have been admiring them. fishfreak, I have been meaning to do a tank like yours for a very long time. I had several coffee pots I was intending to rewire but never got around to it. Kudos for doing it. I see the potential now. ChristopherDido: Simply darling little setup. The Steampunk nature is appealing. Thank you Sunstar! You should definitely go for it! I didn’t use any of the original components of the coffee pot like the heating element, but it could definitely be done. All these picos look amazing! Great job everyone who hung in there! Nice picos everybody! I made the it all the way through the contest with mine, but thought the deadline to submit the summary was tonight... oh well. I didn’t join with any intention of winning anyway. Good luck to all! Thanks @Sunstar I like the vibe of the setup myself, it's in our living room so it had to look appealing. I was thinking I was gonna move everything over to a 2 gallon after the contest, but the more I look at it the less inclined I am to do that. I think it's gonna run until the Zoas grow in completely. It'll be neat to see it what it looks like 6 months from now. I'm gonna have to go through all of them tomorrow when I have some down time and make some very difficult decisions of whose to vote for, they all look spectacular. Sorry to hear about the confusion, Tom! Thank you for participating in the contest and sharing your final FTS with us. Please don't vote yet, everyone! I went ahead and added the poll to the thread, but voting is not yet open. Tomorrow I will update the poll with options to vote for the contestants. 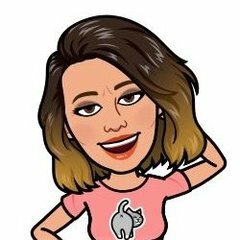 The voting will open at around noon tomorrow (PST). The voting is now officially open! Voted! I really, really, really enjoyed going though all of these. Thanks to everyone that made this happen. You guys rock . Thank you @Sunstar I made the statues out of clay. And thanks to everybody who made this contest happen. It’s been a lot of fun and really shows the potential of these wonderful micro reefs!!! Such an amazing selection of little tanks. Congratulations everyone and thanks @Felicia for hosting such a good contest. Too many amazing tanks to choose from! The voting is so hard and I have a feeling its going to be neck and neck! You're very welcome! It was a ton of fun to host and see what you all put together! This is so hard, everybody is so deserving (yep, I'm the mom thats so happy when all the kids get some kind of trophy ). I'm just glad there aren't as many as there were at the start! Now I have to go back and check out the build threads that I missed. May have screwed it up haha. I wonder if the order of the picos in your post actually effects the results, especially to those voting from mobile. Voted - wish the contestants were listed alphabetically.